Every winter I try to brew up at least one stout. I brewed a batch Pot Licker Milk Stout in November. It was my first experience with coffee in a home brew of my own. I liked it. Nothing like another go around. Morning Mud, the name, is a play on breakfast, oatmeal, and coffee as it is an Oatmeal Stout with coffee. Thesaurus.com comes in handy in those situations. I am not a wordsmith. Morning is obviously a take on breakfast while mud is a slang synonym for coffee. The make-up of the recipe is inspired by a clone recipe of Wake ‘N Bake by Terrapin Brewing Company that I found on HomeBrewTalk.com. If memory serves me, I believe I looked at Breakfast Stout by Founders Brewing Company clone recipes as well. 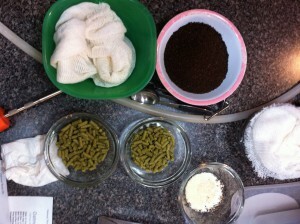 No matter which or both of these recipes inspired me, I wanted coffee in the finished beer. I leaned more towards Wake ‘N Bake for inspiration as I didn’t want a huge beer but ample enough to hold up to the coffee and cocoa nibs. Cold steeping coffee getting ready for secondary. Probably the biggest decision I had in the recipe formulation: use black patent malt or a de-bittered black malt. Since the final recipe called for coffee in the boil and in secondary, I thought that the coffee would lend enough bitterness. Also, black patent lends an ashy flavor and aroma that shows up late in the taste, something I don’t care for. Will the beer have enough balance without the black patent? I will know in six weeks or so. The coffee is the same light and medium blend that I used in the aforementioned Pot Locker Milk Stout. I will be adding close to an ounce per gallon for two days prior to bottling. My mouth is watering. Enjoy! 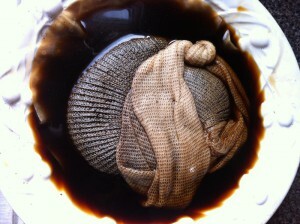 2016-01-10: Fermenting at ambient first floor temperature: 68*F.
2016-02-19: Placed 3.0 ounces of coffee in muslin bag, steeping in cold water. 2016-02-21: Racked to secondary on top of coffee infusion. 2016-02-22: Bottled, 30, 22 ounce bottles. Bottle crown label: OS. Useless Fact: The average North American will eat 35,000 cookies during their life span. This entry was posted on Saturday, January 9th, 2016 at 2:38 am	and is filed under Beer Recipes, Home Brewing. You can follow any responses to this entry through the RSS 2.0 feed. Both comments and pings are currently closed.